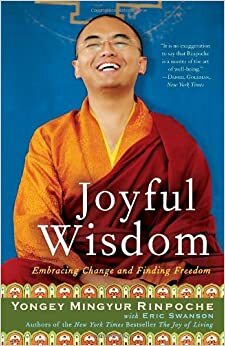 Joyful Wisdom is what I like to summarize (loosely) as a practical guide to Buddhist meditation. The author is a monk from Nepal who travels around the world and teaches these basics. The book is broken down into 3 main sections: Principles, Experience, and Application. He covers the basic thought and history behind Buddhism first, moving onto what those basics mean in your own life, and then tells you how to apply these teachings to benefit your life. He uses examples not only from ancient Buddhist texts and teachings, but also from some of his modern students and what these specific techniques did for them. In the application section, he literally breaks down how to meditate on a specific Buddhist principle with instructions such as, "Assume the 7 point position. Clear your thoughts and think about a person who you feel gratitude for. Don't ponder on it for more than a few minutes." Very practical. Very precise. He even talks about how it's ok and even needed to take breaks, and how even if we feel like we are failing because we can't clear our mind, that's actually a good thing. Basically there is no failure - a nice notion to go into things with, really. I have always been the type of person who was interested in meditation, but I just never found any explanations that made sense to me as to how to go about it. I'm not one who easily relates to metaphysical-speak like, "make friends with your fears." Seriously? What? How does one do that? The greatest thing I gained from this book is an explanation of the meditation process that actually made sense to me. It was also wonderful to learn that I am not alone or unprepared for this practice - in fact, most people feel similar to me when they can't get their head clear enough to focus on what they think they should. It's about clearing other thoughts out of the way so that you can focus on what surfaces during that clarity. If that thought bubbles up to the top, obviously it is at the forefront of your mind and needs your attention. I've never had such a rational sounding break down of meditation before. I fully believe that anyone who is interested in meditation, whether you've tried it and felt like you couldn't do it, or if you're like me and have never fully tried because it never made sense, this book is what you need. There is so much information in here that I'm sure it would help even a seasoned meditator. I'm sure there is plenty more that I could say about this book, but just know that I give this book 4 out of 5 stars.